Tom Brady is "like a god" to some in New England, so Patriots fans at Gillette Stadium rejoiced Thursday when the quarterback was vindicated by a federal judge in the latest chapter of the Deflategate scandal. The man who compared Brady to a god, Kevin Lynch Jr. of South Boston, set the tone for fans that milled about Gillette Stadium early in the afternoon Thursday ahead of a preseason game against the New York Giants. Patriots fans cheered and whooped as news of the nullification of Brady’s four-game suspension spread. Stadium workers driving golf carts through the stadium’s parking lot honked their horns in celebration. Lynch was at the stadium with his father, ticket seller Kevin Lynch Sr., and both said the ruling proved what they always believed to be true: Brady is not a cheater and did not deserve the suspension levied against him by NFL commissioner Roger Goodell. 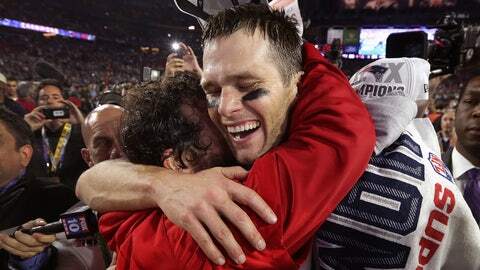 "I always felt the truth would prevail and Brady would come out on top," Lynch Jr. said. "So it’s good for the NFLPA and it’s good for the future." Most Patriots fans who spoke about the suspension said they also believed Brady was innocent of any wrongdoing in relation to the deflation of game balls. Not exactly shocking, considering the audience. "I never doubted Brady," said Kristina Johnstone, a native of Nashua, New Hampshire, who had tickets to the game. "I don’t think that he would have ever cheated. He’s just not a cheater. He’s an amazing player and I don’t think he would have done that." Many fans said the league was wrong to go after a player with the moral quality of Brady, whom fans named an upstanding citizen and role model in a league where others are suspended for more serious matters such as steroid use, domestic violence or child abuse. "It was awful to think that some other players would do these horrible things, and [the NFL was] basically giving Brady the same punishment as them," Johnstone said. "That’s just extremely wrong." "It’s disgraceful that Brady had to go through this in the first place," said Robert Bassett, who was shopping at the mall at Patriot Place with his wife, Jennifer. "The guy is all over the place for charities and all kinds of stuff. He never does a single thing out of line." Not surprisingly, the one person whom fans at Gillette Stadium agreed was out of line was Roger Goodell. Steve Sullivan, a Patriots fan from Sutton, Mass., said the commissioner and the NFL botched the entire Deflategate investigation from the start, as he said league officials failed to properly monitor the game balls during the AFC Championship Game when the Patriots were caught using balls below the prescribed PSI. Sullivan said he read the entire Wells Report, a 243-page investigation into the deflated game balls, and noted faults throughout — including the fact that three out of four Colts footballs tested during the game all showed drops in PSI and the NFL showed no signs of understanding the Ideal Gas Law, a physics concept which explains why balls deflate in cold weather. "Everything they’ve done is very narrow and short-sighted," Sullivan said. "They didn’t mention the fact that the Colts had a needle on the sideline. You’re not supposed to. They didn’t mention the fact that the Colts tested the ball on the sideline. You’re not supposed to do that. The NFL, to me, has botched everything, and in hindsight, it looks like they’re going after Brady to prove a point. It’s more about Goodell’s power with the players as opposed to what’s right." Patriots fans agreed that the court ruling should cause the NFL’s owners to take a hard look at Goodell, though fans differed on their thoughts about what specific action should be taken against Goodell. "Someone should seriously look at this decision, plus other decisions that he’s made in the past which haven’t been that great, and look at it like any other job," Bassett said. "Are you performing your duties as expected? Review it. I don’t know if he should be fired, but somebody’s accountable to somebody else all the time, so I think he should be looked at somehow." It was not just Patriots fans suggesting action against Goodell. New York Giants fan Skip Russell, who was at Gillette Stadium for the game, said the commissioner’s record in court is notable. "It’s just interesting to look at the commissioner and how he’s made a big deal about some of these cases and everything has been overturned," Russell said. "As a league and as owners, you would think that they would think about that and understood he has invested in (several) cases over the last two years and they all were overturned. It’s something to think about." In 2012, four New Orleans Saints players had suspensions from the "Bountygate" scandal overturned following appeals. Earlier this year, Minnesota Viking Adrian Peterson had his indefinite suspension following a child-abuse case vacated in federal court, and free agent Ray Rice won an appeal in December 2014 of his indefinite suspension for domestic violence. According to Sullivan, the repeated court cases contesting league punishments will have a long-term effect on trust in the league between the players and the owners. "The possibility of the next CBA being very contentious is going to be a problem because this is going to be brought back to Adrian Peterson, Bountygate, all these decisions that the commissioner has lost are going to come back and haunt him," Sullivan said. "It’s now going to ruin the long-term relationship the owners have with the players, so I think the NFL owners are ultimately going to have to pay the price for this. "Personally, I believe in a strong commissioner and my understanding is that Goodell doesn’t have any extra powers than previous commissioners, but it seems like he’s abusing it or he’s incompetent. Either way, he’s not a good face of the league." Although New England fans acknowledged that many fans of other teams across the country will probably still root against the Patriots, people at Gillette Stadium said the nation should keep the court victory in mind when they think about booing the Patriots. "You don’t mess with Boston teams," Bassett said.